Electric Hoist Market PDF « Global Market Insights, Inc. Riding on the hallmark of durability and reliability, CM’s latest Lodestar chain hoist is claimed to be a breakthrough in electric hoist market. Recently launched, this iconic product by Columbus McKinnon Corporation reportedly integrated Lodestar’s flagship industry acing design with Magnetek’s enhanced featured premier VFDs. Endorsed with Magnetek’s advanced IMPULSE® G+ Mini drive, Lodestar VS electric chain hoist apparently harnesses the power of intelligent lifting with an absolute state-of-the-art Hoist Interface Technology, CM HI-Tech™. If reports are to be relied on, this is one of the easiest computer interfaces ever utilized in electric hoist market and is certainly the fundamental factor driving CM’s pronounced stance in the competitive landscape. Allegedly, CM HI-Tech™ allows operators to quickly adjust the hoist performance and speed, in a bid to ensure a sync between the precision load control and application required. The product has already become a subject of focus among the investors, despite the fact that the business space is ablaze with numerous other innovations by eminent companies. Driven by such an innovative product landscape, electric hoist industry garnered a revenue of USD 1.9 billion in 2017. The competitive spectrum of global electric hoist industry boasts of a portfolio of renowned biggies including the likes of Ingersoll-Rand plc, Beta Max Hoist, KITO Group, SWF Krantechnik GmbH, ABUS Kransysteme GmbH, Hitachi Industrial Equipment Systems Co., Ltd, and Konecranes Oyj. Having already substantiated their stance in the lucrative business sphere, it is expected that in the years to come, they would further brainstorm innovative solutions that would bring appreciable monetary returns in the marketplace. In this regard, it is prudent to mention that electric hoist market players pertaining to the rising demand for technological integration, have been bending over backwards on strategic alliances and subsequent product differentiation. A recent precedent underlining the aforementioned declaration is KITO Corporation’s acquisition of all shares of Erikkila, the Finnish lifting equipment manufacturer, under its fully owned subsidiary, Kito Europe. Reportedly, the Japan based electric hoist industry firm has procured Erikkila’s crane production business in a bid to consolidate its position in Europe market, via Erikkila’s extensive European sales network. Experts’ believe, Erikilla’s lightweight modular cranes in its extensive product range in all likeliness, would enhance Kito’s already established portfolio in electric hoist market. Regionally, the Asia Pacific belt reigned as a supreme power in global electric hoist market in yesteryear, primarily on account of the robust automotive expansion in this region. While the marketplace is characterized by an extensive application array, automotive applications have emerged to be a profitable investment spot for companies, given the fact that these hoists have made cargo handling more efficient and reliable. Not to mention, the profitability quotient of electric hoist industry undeniably relies on the changing trends of automotive sector. Statistics indicate that the Asia Pacific turf houses numerous light weight vehicle producers with Japan, China, and Korea at the helm covering almost 42% (37 million units) of the global auto production market. Thriving on yesteryear statistics, China alone produced nearly 4.2 million commercial vehicles and 24.8 million passenger cars – estimates depicting China’s pronounced growth prospects in APAC electric hoist market. For the record, APAC electric hoist industry is slated to enter the billion dollar frontier by 2025, with a projected CAGR of 7.5% over 2018-2025. All in all, it would be apt to mention that electric hoist market growth is highly ancillary to product advancements. Not to mention, skilled operators and qualified maintenance staffs would further have a substantially impact on the profitability quotient. 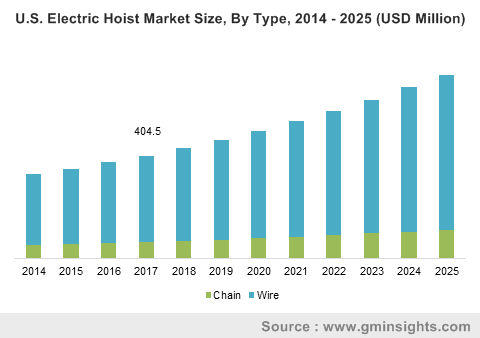 With changing technologies and newer breakthroughs in lifting ecosystem, electric hoist is slated to exceed a valuation of USD 3.4 billion by 2025. This entry was posted in HVAC and Construction, Uncategorized and tagged APAC Electric Hoist Market, Chain Electric Hoist Market, Electric Hoist Industry, Electric Hoist Industry Analysis, Electric Hoist Market, Electric Hoist Market 2018, Electric Hoist Market 2024, Electric Hoist Market Analysis, Electric Hoist Market Application, Electric Hoist Market forecast, Electric Hoist Market growth, Electric Hoist Market Outlook, Electric Hoist Market PDF, Electric Hoist Market report, Electric Hoist Market share, Electric Hoist Market size, Electric Hoist Market Statistics, Electric Hoist Market trends, Europe Electric Hoist Market, Global Electric Hoist Market, Load Bearing Capacity, North America Electric Hoist Market, U.S. Electric Hoist Market, Wire Electric Hoist Market.